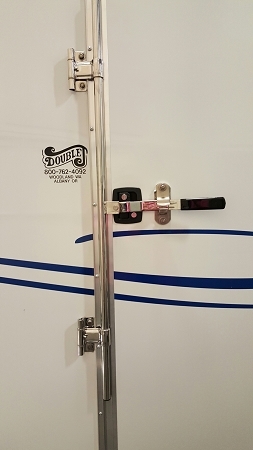 This steel door latch is commonly used on tack doors and ramps of horse trailers, and to reinforce side doors that any animal may be able to push against from the inside. 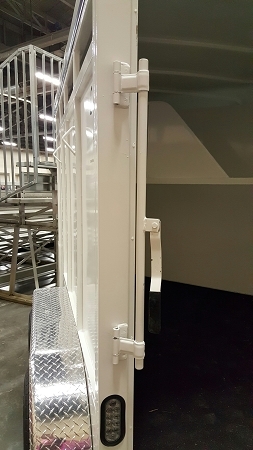 Also used to hold doors closed of utility trailers. Comes complete with 36" long, 3/4" ID pipe welded to hinges & handle. Heavy Duty, weighs 7 lbs. Metal end caps. Can be painted to match the trailer. Steel cam bar door handle, with grip included. Hasp Included: The bolt centers are 4 5/16" apart, and the top bolt holds the hinged top piece that swings to trap the cam bar behind it. The total length is 5 1/8" and total width is 2". Same as SKU: CLHP2. When installed properly, the pipe lays flush to the door when the door is fastened closed. The integrity of this product is compromised when the hinges are bent after market. Thank you for the great product and fast shipping.